Some telescope advertisements include phrases about the very high magnification or power that their instruments can achieve. These telescopes usually have about 60mm (2.4") diameter apertures, and claim magnifications of 600x or more. It is true that their images can be magnified that much but what they end up magnifying is all the turbulence in the air between the telescope and the subject. When you are looking at astronomical objects, you are looking through a column of air that reaches to the edge of space and that column seldom stays still. Similarly, when viewing over land you are often looking through waves of heated air radiating from the ground, houses, buildings, etc. A good rule of thumb is that the usable magnification of a telescope is about 50x per inch (2x per mm) of aperture under good conditions. Values of 3x per millimeter or higher are often quoted for ideal conditions, but these conditions are usually very rare. 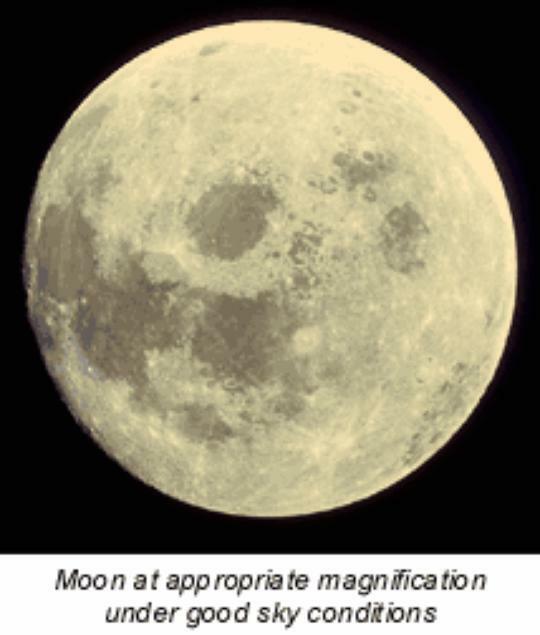 The final resolution that an astronomical telescope can achieve depends on the amount of light that it can capture. The bigger the aperture, the higher the resolution and therefore the better the image. However, there are times when the earth's atmosphere is so unsettled that a smaller aperture will give better results because it sees fewer turbulent zones. A telescope cap with a smaller opening which acts as a mask, can prove to be a useful accessory under these conditions. Sky conditions are usually defined by two atmospheric characteristics, seeing, or the steadiness of the air, and transparency, the clarity of the air due to the amount of water vapour and particulate material present.